There are many ways to use Tarot cards beyond the well-known process of traditional readings. Here’s a way to create a happier, more fulfilled life today using messages and advice from the Queen of Pentacles. Do something today to pamper yourself. Here are some suggestions: Eat savory foods, take a luxurious bath, listen to soothing music, or get a massage. In short, set aside some time today to focus on your enjoyment of life. Spending time outdoors, especially in green spaces, is one of the fastest ways to improve your health and happiness. It’s been shown to lower stress, blood pressure and heart rate, while encouraging physical activity and buoying mood and mental health. Some research even suggests that green space is associated with a lower risk of developing psychiatric disorders. Today, spend at least 20 minutes in a park or elsewhere out in nature. Physical activity (hiking, for example) while you are there helps, but it is not necessary. Many of these suggestions from the cards about how to live a happier, more fulfilled life were inspired by my pithy Tarot meanings and by material in my book, The Soul’s Journey. 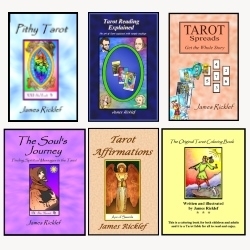 If you like them, you’ll love my books, Pithy Tarot and The Soul’s Journey. Also, for more Tarot messages, LIKE my Tarot Facebook page. For a list of all my “Tarot and Happiness” posts see my article titled Find Happiness with Tarot Cards.